SBI Yono ko India ke Finance Minister Arun Jaitley ne 24 November 2017 ko launch kiya tha. Iska main goal Indian Digital Life ko easy banana hai. Isliye ismen banking ke sath lifestyle se judi important works ko kiya ja sakta hai. Tabhi to is app ka moto “Banking aur Lifestyle dono” hai. Vaise is app ka full form “You Only Need One” hai. Isme SBI ne Money Transfer, Balance Janana se lekar Food, Cab, Rent etc facility ko add ko kiya hai. 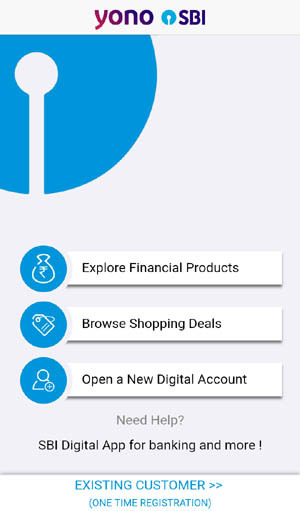 SBI ne YONO App ko people ke digital life easy & secure banane ke liye laya hai. Jismen 60 se jyada important service available karai gai hai. Isliye ye kisi bhi government app se jyada feature vali app hai. Vaise is aap ko YONO by SBI kaha jata hai, lekin simple language me Yono SBI App bola jata hai. Google Play store par yah app only 8.61 MB ki hai, jise 5 million se jyada people install kar chuke hai. Ise 3.5 ki rating mili hui hai. SBI chahata hai to jyada se jyada people ise use kare, isliye is app ka promotion karti rahti hai. 1.Instant Account Opening – only 5 minute me is app ki help SBI account open kar sakte hai. Bas keval aapko Pan Card aur aadhar card ki jarurat padegi. 2.Quick Pay – Koi payment karana hai to is app ki help se quickly kar sakte hai. 3.Instant Loan – 1 lac rupees tak ke loan without documentation ke kuch steps follow kar le sakte hai. 4.Online Shopping – Kahi bhi online shop kare, isse instant payment kar sakte hai. 5.Book A Cab, Food, Movies – Daily need ke liye all in one app ki tarah isko use kiya ja sakta hai. Aap isse Cab, Food, Movies, Book, Medical, Travel etc jaise facility ko book aur pay kar sakte hai. 1.Sabse pahle Google Play Store se is app ko install kare. 2.App ko open kare aur Existing Customer par click kare, jo bottom me mil jayega. Yadi SBI me Account nahi hai to Open a New Digital Account par click kare aur Pan card aur Aadhar card details submit kare. Instantly aapke account ko approval mil jayega. 3.Ab Yadi aap SBI Internet Banking use karte hai to “I have Internet Banking ID. Register me for Yono” select kare login ho jaye, nahi hai to second option choose kare. 4.Second option ke liye ATM Card aur Registered Mobile Number ki jarurat padegi. Jisse aap is per registered ho jayenge. 1.Yono open kare aur login ho jayega. 2.Ab homepage kai icons milege, jinse kai work kar sakte hai. My Relationships se Balance Check kar sakte hai. Financial Products se Money Transfer aur Loan le sakte hai. Shop se online shoping ke liye payment kar sakte hai. Book & Order se Cab, Food, Mobile Top Up kar sakte hai. Fund Transfer se instantly amount transfer kar sakte hai. Aap jyada feature ke liye upar triple line (navigation icon) kare. 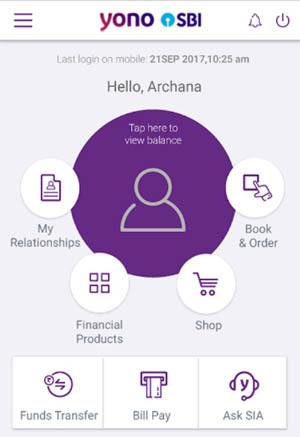 YONO By SBI ek secure and easy to use app hai, jisse aap banking ke sath apne daily requirement ko quickly and easily kar sakte hai. Bas aapke pas SBI account hona chahiye. Hope apne Yono app ke bare me sabhi information pa liye honge. Yadi aap is post ko helpful pate hai to Facebook, Twitter aur Whatsapp par share kare.